Institute for Economic Inquiry – The opinions expressed on this blog are those of the authors alone, and do not reflect the opinions of the Creighton Institute for Economic Inquiry (IEI). IEI is not responsible for the accuracy of any of the information supplied by the Bloggers. The opinions expressed on this blog are those of the authors alone, and do not reflect the opinions of the Creighton Institute for Economic Inquiry (IEI). IEI is not responsible for the accuracy of any of the information supplied by the Bloggers. The following was written by Ben Bonebrake as part of his work on historical preservation in Omaha. Mutual of Omaha is a well-regarded corporate citizen in Omaha. As a highly respected Fortune 500 insurance company, the firm has a history of promoting Omaha both locally though sponsorships and nationally through its company name and the Mutual of Omaha Wild Kingdom on the Animal Planet channel. Mutual of Omaha’s reputation was reinforced in 2010 through a massive investment in midtown Omaha with the opening of Midtown Crossing. Yet this long-standing positive view of Mutual of Omaha was put under strain when the traditional insurance company dipped its toe in commercial real estate and planned to demolish a pair of century old buildings in the process. Following the 2010 grand opening of Midtown Crossing, Mutual of Omaha believed that outside investors would continue to invest in midtown Omaha. Despite Mutual’s initial 16 acre, $365 million mixed use development adjacent to their world headquarters, the additional outside investment failed to reach expectations. Dismayed, Mutual of Omaha concluded that the fractured nature of midtown property was the reason for lackluster investment in Midtown, despite their massive Midtown Crossing stimulus. In response, Mutual of Omaha began purchasing numerous tracts of land under the name of Turner Park East LLC with the goal of acquiring a large area of land to sell to an independent developer to help further their efforts in revitalizing midtown. 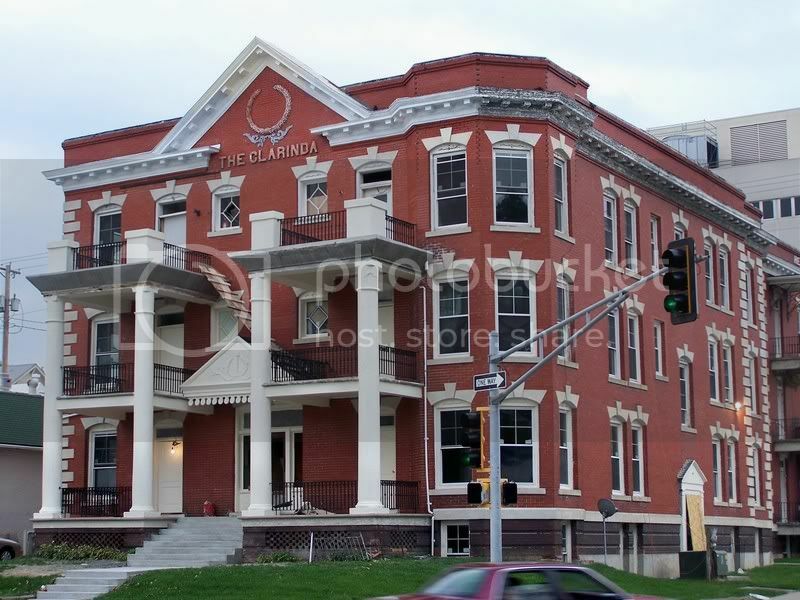 In early 2014, Mutual of Omaha set its sights on the Clarinda and Page Apartment Buildings for acquisition and demolition. Mutual of Omaha saw the property as a key piece in driving further development in the midtown area. The Clarinda and Page Apartment buildings were both over 100 years old and were designed in the Georgian Revival style by architect William W. Welch (from Clarinda, IA which is in Page County). Built in 1909 and 1914 respectively, these two midtown apartment complexes “represent the type of luxury apartments which developed along the city’s picturesque parks and boulevard system after the turn-of-the-century,” (Omaha LHPC). Both buildings were a part of the National Register of Historic Places and designated Local Landmarks via the Landmarks Heritage Preservation Committee as of April 21, 1981. The Clarinda Building was in better shape between the two. It was home to 16 condominium units that were rapidly losing value and falling into disrepair despite renovations in 2007, partly due to the housing market crash in 2009. The Page Building was worse. In 2006, the City had declared the building as unfit for human habitation. Local preservationist groups such as Restoration Exchange Omaha argued that the building could be brought back to a habitable and marketable level. In the end, this large and central project in the midtown neighborhood turned out to be too much of an incentive for Omaha city leaders. Mutual’s investment in the Midtown area, with another potential development in the hundreds of millions of dollars range, brushed aside concerns over preservation. One of the major flaws in this plan was the lack of a concrete deal in place for the property at the time of debate. Despite this, Mutual successfully argued that the buildings were not truly historically significant, despite the Local Landmark designation which should be rescinded. The City of Omaha agreed, and the buildings were removed from the register in July of 2014. Mutual demolished the buildings in mid-November of 2014. Over two years later, in December of 2016, Mutual announced vague plans for the entire area east of Midtown Crossing with Minneapolis-based Ryan Cos. to be the primary developer, with a starting date goal of late 2017. In March of 2017, Mutual received some welcome corporate welfare when they announced that the project was getting a boost from the city in the form of a 400-unit parking structure (estimated $6.8-8 million cost to the city). Mutual was still hoping that Ryan Cos. would be able to break ground on the first office structure in the planned development before the end of 2017, but as of November 2018, a four full years after their demolition, there is still no progress and the property that used to be home to the Clarinda-Page Apartment buildings is still just a grass field. Tearing down historical buildings for the mere promise of growth risks having neither growth nor historical buildings, which is the worst of all outcomes. While it is likely that Mutual’s proposed development will likely be built given their history and resources, Omaha citizens should demand more from their representatives. This particular demolition is evidence of irresponsible growth and a lack of planning. The only thing that has been eliminated by razing the structures are any alternative bids for their development which would preserve the history of the buildings. If an architectural firm was working to destroy multiple century-old buildings with a substantial architectural significance it would challenge our basic instincts about being an architect. I had a similar reaction when I heard Omaha Performing Arts Center, a private organization dedicated to promoting the arts, would be working to work with HDR, an Omaha Architectural firm, to remove three historic buildings from downtown Omaha in 2015. In the end, only a failure to coordinate between these firms and the city saved the buildings, Omaha needs a more transparent approach to historic preservation. Christian Specht building, located at 1110 Douglas Street in Omaha, Nebraska; seen from the southwest. In late 2015, HDR had out-grown its headquarters as the company grew to almost 10,000 employees worldwide from just over 1,500 20 years prior. This growth, combined with the end of their current lease in 2018, led to HDR to look for a place to locate their new world headquarters. HDR was clear from the beginning that they never considered leaving Omaha. ConAgra had just moved from downtown Omaha to Chicago, and HDR offered 1,000 Omaha area employees, a $200 million investment, and a good sized (16-20 stories) office tower to the downtown area. The property targeted by HDR was being used as a surface parking lot by Omaha Performing Arts (OPA) for the Holland Performing Arts Center. OPA valued the parking for their patrons. The Holland was willing to sell the land in exchange for land located to the East, but needed the city’s help, as there were three century-old buildings that would need to be bought out and demolished. The buildings were The Christian Specht Building, the Happy Hollow Coffee Building, and the Alvine Engineering Building. The Christian Specht building is the only one of the three to be registered on the National Register of Historic Places as well as listed as a local landmark as of 1977. Built in 1884, it is an Italian Renaissance Revival style building and has a cast-iron façade. It is one of only a few buildings in all of Nebraska to be built with this feature and the only one that still remains. The Alvine Building was originally two separate buildings known as the Marshall Paper Co. Buil ding and the T.H. Smith Co. Building. They have since been combined into a single building with one address. Built from 1891-1892, both of these buildings were designed in the Renaissance Revival style. The Marshall Paper Co. Building was originally four stories tall but lost two of them in a fire in the 1940s. 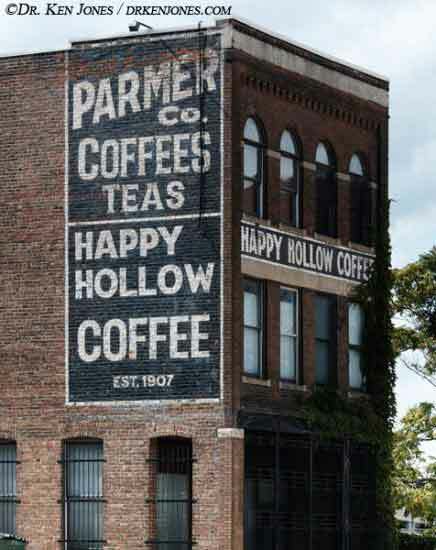 The Happy Hollow Coffee Building was built approximately in 1900. Like the other buildings, the Happy Hollow Coffee building was also built in the Renaissance Revival style and was recognizable for its historic painted advertisements and iron-gated patio. All of the buildings were in great shape and occupied, serving the Omaha area by providing jobs and residential units. The Omaha city council announced that they had successfully mediated a deal with OPA, HDR, and the owners of the three, century-old buildings. The city would purchase the three buildings for a total of nearly $11 million, which they would then give to OPA in exchange for OPA selling their parking lot to HDR for development. Local speculation was that the buildings would be demolished for an expansion or additional parking. However, for reasons that were never fully disclosed, the agreement fell through. OPA did want more than the previously agreed upon $3 million for the parking lot. Additional factors mentioned by HDR were the increasing costs arising from trying to build on OPA’s property as well as the timeline for their current lease. After much time, effort, fuss, and fervor over the prospect of a new major employer downtown, HDR scrapped their plans for a downtown headquarters, eventually settling on a site in Aksarben. The Omaha City Council ended up killing the initial agreement to buy the three, century-old buildings. While, in the end, the three century-old buildings were saved from demolition, it was not because of the efforts of HDR, OPA, or Omaha. Rather than reasoned debate about the significance of these buildings and their legacy, only timing and bad negotiation saved the buildings. For this reason, it is important for citizens to not rely on organizations with varying interests to protect such structures, and must work to protect such structures on a personal basis. The name ConAgra, previously known for its line of popular processed foods, now leaves a bad taste in the mouths of the people of Omaha, after moving its headquarters to Illinois. In the eyes of many, ConAgra held the city hostage, received massive tax breaks, is partially responsible for the largest destruction of a historic district in history, only to abandon Omaha 30 years later. To understand the animosity for ConAgra, one must know the history, ConAgra’s actions, and the disregard for historical buildings. One must first know about Jobber’s Canyon and InterNorth to evaluate ConAgra’s indelible mark on Omaha’s Architectural legacy. Jobber’s Canyon was a warehouse district taking up a 6.25 block area in downtown Omaha made up of 22 brick warehouse buildings built between 1888 and 1932 as well as 4 noncontributing buildings. The 6-10 story warehouses lined brick and cobblestone streets creating a canyon-like effect. The buildings were demolished despite earning historic preservation status before their demolition. The long-term effect resulted from short-term concern over InterNorth, an Omaha natural gas company, leaving Omaha. The city was hit hard and lost more than 1000 local jobs. That same year, ConAgra began its process of looking for a new home. ConAgra was growing and needed a new corporate headquarters. News of ConAgra’s search spread across the country, and soon other states began to recruit ConAgra to relocate to their respective state. Armed with significant leverage, and with Omaha leaders terrified of losing another major employer, ConAgra CEO Charles (Mike) Harper was able to lobby Nebraska state legislators for significant tax credits. With these tax reforms, ConAgra was content with staying in Omaha. However, Omaha leaders recognized the value ConAgra’s thousands of employees would bring to downtown and felt that if ConAgra did not locate downtown, the urban center would be set back decades in progress. Convincing ConAgra to build downtown seemed unlikely, as an office high-rise building didn’t fit Harper’s wishes. Harper’s plan was a sprawling, suburban-style corporate campus to fit his decentralized, subsidiary styled corporate structure. Omaha civic and business leaders were determined to make it work, and the size of ConAgra’s workforce gave the company leverage. The city proposed the Central Park East site, located on the riverfront adjacent to Jobber’s Canyon, which intrigued ConAgra, but they wanted the site to include Jobber’s Canyon. This caused a stir, as just months earlier, the entire district had been registered on the National Register of Historic Places, a process that required a considerable investment of time and effort on the city’s part. The potential demolition of Jobber’s Canyon faced national scrutiny. It was a massive historic district that was still in use, was universally held in high regard, as evidenced by newspapers from around the nation like the New York Times chiming in on the issue. Jobber’s Canyon itself was at the beginning of a multi-million-dollar revitalization. Alley Poyner was hired by the city to integrate the two plans that fulfilled both Harper’s desires and incorporated Jobber’s Canyon. Their plan was considered a wild success, calling for the demolition of only two buildings with the corporate campus arranged to the East. It outlined a campus of several buildings, a high-rise, and a lake. However, in June of 1987, Mike Harper deemed the “big, ugly red brick buildings” incompatible with his vision. Jobber’s Canyon did not survive. The Fairbanks Morse Building had been protected as a local landmark under the Landmark Heritage Preservation Committee. The LHPC ruled unanimously in their January 21, 1988, against removing the historical designation which would allow the ConAgra plan to proceed. Despite the unanimous recommendation by the LHPC, the Omaha City Council voted unanimously to remove the designation from the Fairbanks Morse Building and proceed with the proposed plan. By the end of 1989, all but one of the 26 Jobber’s Canyon buildings had been razed. To add insult to injury, ConAgra relocated to Chicago 26 years after demolishing Jobber’s Canyon and perhaps most bitterly, chose a revitalized turn of the century building to be their home. ConAgra’s special treatment is one of many examples of corporate favoritism, but the subsequent demolition of Jobber’s Canyon makes it stand out from the crowd. Omahan preservationists were rightfully angry with how ConAgra treated them, but in order to avoid being hurt again, they will have to turn that anger into action. Elected officials must not give large corporations special treatment and should establish clear rules that are transparent and apply equally to all. And if the elected officials fail to hold up their end of the bargain, it is up to the citizens to hold them accountable. This is how cities can protect themselves from being hurt by corporations in the future. One of the delightful joys of summer is spending some time walking around Omaha. I have the great pleasure to live in the Dundee neighborhood in Omaha and have been enjoying walking around the area with my kids on a few of the more mild summer days. In the past week, I have taken the opportunity to walk down both California and Cass streets between 30th and Saddle Creek. This is about a 15-block area on both streets. In the midtown area, there has been quite a bit of construction. People in Omaha might know that the Gifford Park area has seen a huge resurgence in the 10 years since Mutual of Omaha helped to revitalize the area with an investment called Midtown Crossing. New business and residential construction here was a major part of the increase in property values over that time. 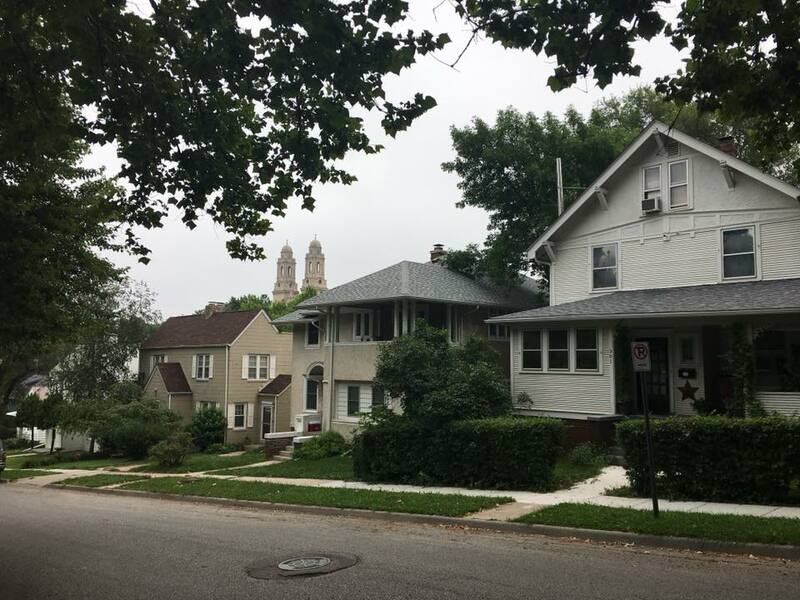 In my own four years in Omaha, I have seen the areas of Gifford Park, and the “gold coast” area on the ridge between 38th and 40th street start to rebound as owners are putting love into the gardens and exteriors of homes, some of which are over one hundred years old. On one side of this ridge, 40th street, the Joslyn Castle and St. Cecilia’s Cathedral anchor the neighborhood, the latter’s towers distinction to Omaha skyline from as far west as 72nd street. On the other side, houses take advantage of views of the downtown area looking across past the city to the Missouri river to Council Bluffs, IA beyond. I am truly excited to see this neighborhood grow and change. It is a mix, a type of spontaneous order of projects. On one block fresh landscaping shows me that owners of one home are taking seriously the charge to care for a lovely gem of a historic home. There are plenty of mansions perched prominently to impress. There are lovely little brick apartments from duplexes all the way up to fully renovated buildings. Some homes, particularly those lower in elevation closer to 45th street and in the trough along Cass Street, about halfway between Gifford Park and the gold coast, have avoided any serious maintenance. Some sit with junk on the porch so thick as to betray the owner’s excessive hoarding problem. Some sagging roofs point to serious structural problems in the house. Some have allowed their gardens to overgrow to the point where the house is partially obscured behind plants of an eclectic variety. All of these might be the understandable reaction to falling property values and the legacy of the neighborhood from before the recent gentrification. There is so much potential in revitalizing the area. Walking along Duchesne Academy’s soccer fields and lovely old school building on California and 38th, I imagine what it might be like by the time my girls are old enough to go to school in this neighborhood. All of this puts a lovely face on the idea of gentrification. There is no homeowner association in these neighborhoods. The demand for housing is part of a nation-wide trend for people to return to living in denser neighborhoods, but I admire the process of revitalization that I have seen. I also worry that as rents rise, some folks are being displaced. It is hard for a Creighton professor to not be overjoyed that one of the neighborhoods near campus is becoming an attractive place to live. On all sides of campus, Omaha is becoming a much more attractive place to live. A new pedestrian bridge over highway 75 has created another easy way to move through these areas, helping to address the crippling effect of the intrusion many decades ago of this highway and interstate 480 which carved out the borders of campus, isolating pedestrians from these neighborhoods. One gets the sense walking through Omaha, either along California or along Farnum, that the city is walkable again. I have seen pictures of what this midtown area had become by the end of the 1980s as businesses and residents moved out west. I wouldn’t have wanted to walk through the city then. As I learn about the architectural past of Omaha, I am excited by the future. The various homeowners who will continue to write new stories in homes that housed our predecessors. What is going on in our town is inspiring, and I hope that some of the musings that IEI’s urban economics group does on policy in Omaha captures the spirit of this enthusiasm for our city as neighbors and as community members. This spring Creighton University students will take on the topic of prudent charity. The concept of prudence has long been associated with the ideas that were formally realized in the discipline of economics. Charity, an equally expansive concept, comes from the word caritas or what unites us to God. These ideas don’t necessarily contradict, but in practice, they tend to highlight different areas of intellectual interest. To create this conversation IEI has asked Dr. Christina McRorie to help plan and administer a conversation among the students that will ultimately end the weekend of April 20th – 22nd in St. Louis with a symposium hosted by St. Louis University and Lindenwood University. Click “continue reading” for the list of readings. This week in the Philosophy, Politics, and Economics reading group, we read and discussed An Essay on Fiscal Federalism by W.E Oates. The article examined the ways in which a restructuring of our federal and state relationships could improve government performance. We also read and discussed The Dilemma of Fiscal Federalism: Grants and Fiscal Performance Around the World by Jonathan Rodden, which addressed the positives and negatives of fiscal equalization. On the discussion board, the conversation center around two main topics: The relationship between federalism and civil rights and the dilemma of fiscal equalization and exit. Click “continue reading” for a selection of our conversation. The following was written by the Urban Policy Research Group. Mass Transit moves people, reduces congestion, and helps a city grow. It can come in the form of buses, subways, or streetcars. Understanding how public transportation is central to an urban development plan is the first step towards understanding the dynamics of urban living. Continue reading Streetcars: Mobility or Amenity? This week in the Philosophy, Politics, and Economics reading group, we read and discussed Polycentricity, Self-Governance, and the Art & Science of Association by Peter Boettke, Jayme Lemke, and Liya Palagashvili. The article discussed the similarities and differences in the art and science of association between Elinor and Vincent Ostrom and the Austrian school of Economics. We also read and discussed Charles Tiebout’s seminal 1956 essay, A Pure Theory of Local Expenditures. On the discussion board, the conversation center around two main topics: Exit, voice, and loyalty applied to controversy surrounding the NFL and the interplay between polycentric governance and feedback. This week in the Philosophy, Politics, and Economics reading group, we read and discussed The Welfare State as a Fiscal Commons: Problems of Incentives Versus Problems of Cognition by Keith Jakee and Stephen Turner. The article discussed the similarities between the tragedy of the commons and federal entitlement programs. We also read and discussed “Governing the Budgetary Commons” What Can We Learn from Elinor Ostrom? On the discussion board, the conversation center around two main topics: the role of analogy in solving real life problems and the applicability of a commons framework when thinking about the federal budget.